Being a massive fan of Neal Shusterman, I was therefore extremely excited to see that Scythe was being published in the UK and even more excited to get it for review. 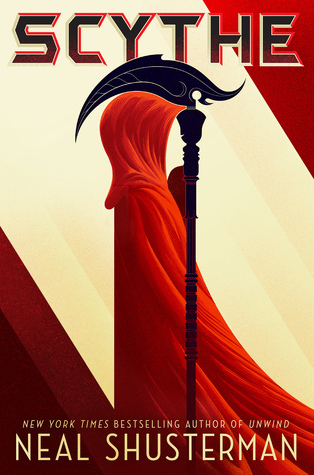 Scythe is one of Neal Shusterman's best, with twisting turns that no one will see coming and leave you hanging for the sequel. Scythe follows Citra and Rowan who by two different reasons become Scythe's apprentices who are made to kill the other. This in itself is a great plot detail but is even more significant as we get to know both characters so well over the course of the book as it is told in duel perspective. The characters are also developed through the story so of course, as the reader, we don't want any of them to die. Except for Citra and Rowan, we get to know a lot about the Scythes in the book which was so interesting especially Scythe Curie who was an interesting character due to the motives that she has. This was developed especially through her entries that were littered through the book and was definitely a nice touch and something that I had also seen in the Unwind series. Talking of the Unwind series, I knew two things, that Neal Shusterman was great at plot and those twists and that he knows how to create a good dystopian world. These, of course, are much the same in Scythe. The worlds he creates seem so perfect on the surface and it this case, it is a world without death but as you peel the layers away it highlights something so sinister but so capturing to read which makes this world so unique and something that I would love to see develop in Thunderhead. Of course, Shusterman knows how to write a good plot and my God is Scythe not an except to this rule. As the book progresses, it gets darker and darker that was a surprise on the next page. No spoiler but stuff goes down in this book. I mean STUFF GOES DOWN. It was just so good to read about and the end is just so good. I need to get my hands on Thunderhead and it would be no surprise it that one is as good or even better than Scythe. Scythe is an action-packed, thrilling read which is Neal Shusterman at his best which is always. I was really excited to read The Wonder of Us not only because it sounded like a great summer read but also because the focus was on female relationships. Both of these together was, therefore, a match made in heaven and it was a great read. 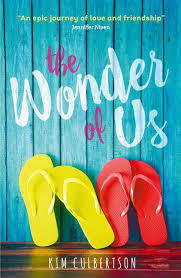 The Wonder of Us was a great contemporary that is perfect for the summer. Being the focus of the book, the relationship between Riya and Abby is the best part of the novel. Their friendship is complicated which is what a book should show. I have seen some opinions saying that this may be overdone with their relationships being too dramatic but at the end of the day no relationship is perfect and you do need to move the plot forward. I do agree with some parts where they do withhold information from each other and this but create drama that doesn't need to happen but this did not affect the overall book. I also had some problem with the writing between the two narratives of Riya and Abby. I don't think they were separate as people and their voices were not completely different. This was a slight problem but I did get over this once I was into the story. I also think they had different roles in the story which was good and made them separate in that respect. There was also a lack of romance for the main two protagonists which was nice to see and did make the book a focus on their relationship. This is something that I am always trying to find in YA so this was a massive plus for me. The book also takes us to many different cities and countries around the world. I found that this was really interesting as most YA books are centred in America and although this is the case with this book too. It took the reader to many other places mainly Europe but especially Iceland. This was definitely something that I loved reading about as it is a place that really interests me and was so interesting to read about as a unique place for a YA book. The Wonder of Us is a wonderful summer read celebrating friendship and what it means to treasure the world around you.